﻿The Maryland Wear and Carry is the concealed handgun permit to carry a firearm in Maryland . We are the #1 advocate of helping those who qualify for a permit, get the permit! As a Pastor of a church you qualify for a permit. As a Christian business we will do all we can to help you. ﻿The Maryland Wear and Carry programs are taught throughout Maryland by full time firearms instructors. Carrying a firearm is a responsibility, and one that Fortress Training takes very seriously. As a result, we provide some of the most professional training in the state. Our training is split into two 8 hour days. Both days you will use firearms of various types. 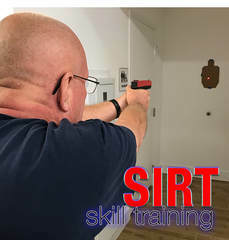 We will have professional SIRT training pistols in your hand on day one. Day two, we will have you shoot a 100 round course and spend time learning about the real core of training, staying alive and out of prison and the morgue. It's the MIND! This is a Fortress Training Exclusive! ​​Do You Qualify For a Maryland Permit? Working the brain and more! This is a 100 round LIVE FIRE range day. Your day comes from two places. As an instructor for Glock, we bring you drills on using a tactical firearm and also drills from a federal law enforcement agency. You will watch an actual robbery take place on video, see how fast it happens and the response of the carrier. Sign up now and reserve your seat in our day one classroom training and range day. * Larger classes will have multiple range days. Do You Have Questions You Need Answered? Thank you and we look forward to meeting you soon and helping you get a Maryland Wear and Carry Permit.